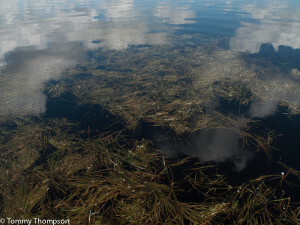 Floating Grass Slowing Your Fishing This Summer? Try a Weedless Frog Lure! Summertime means floating grass is abundant on Florida’s Big Bend! On our Natural North Florida Big Bend, floating grass seems to take over our coast during late summer months. And there are numerous conspiracy theories as to why huge mats of grass clog the intakes of outboard motors and make fishing for redfish and seatrout with topwater lures almost impossible. It’s not that our grass flats are declining, nor it it that scallopers have stirred up the bottom and loosened the grass. An aircraft carrier probably couldn’t do the same job that Mother Nature does late each summer, in terms of releasing excess grass from our flats. In fact, it’s just a part of the natural life cycle of turtle and manatee grass that we find lots of floating grass atop our fishing spots. The fact that grass mats are floating isn’t a bad thing when it comes to providing cover for predators. Offshore, cobia and dorado (mahi-mahi or dolphin fish) often hide under grass mats, seeking shade and lurking there to ambush baitfish. Inshore, redfish do the same, often right up against shorelines or creek mouths. 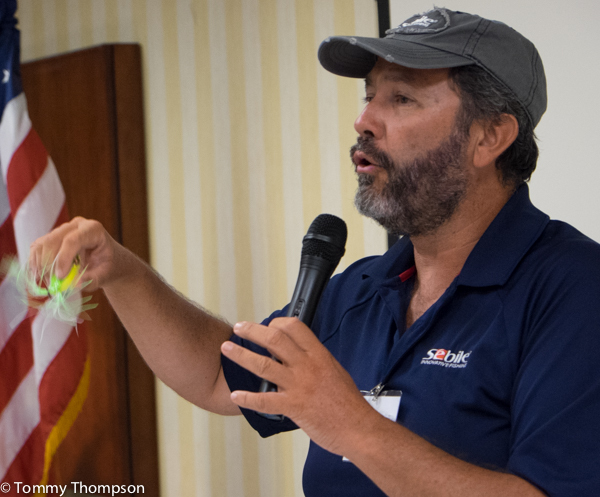 In either case, anglers need to be aware of the grass “problem”, and have a plan to handle it. Many saltwater anglers discount the use of freshwater-designed baits, thinking that their hooks or shapes are not salt-ready. but many manufacturers of freshwater lures are ahead of the game, making lots of lures and hooks that work well in salt as well as fresh water. A good example is the weedless spoon, made by Eppinger or Johnson. These were originally made for northern lakes, and are proven lures for saltwater as well. But the attack on a lure is best appreciated by anglers when a topwater lure is attacked. And being able to drag a lure over floating grass is a sure way to attract a big coastal redfish! 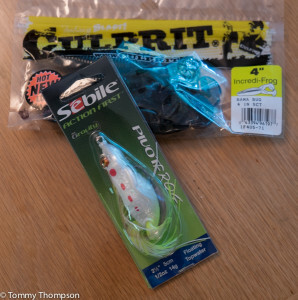 Frog lookalikes, like the Sebile Pivot Frog and the Culprit Incredi-Frog are now popular with saltwater inshore anglers. I recently fished with Captain Rick Davidson at Steinhatchee and we “fought” floating grass all day. However, he had more explosive strikes on, of all things, a Sebile Pivot Frog lure. The strikes were good, but I think the long trailing legs needed to be cut back to improve the dynamics of the cast. These bulky lures are hard to cast and trimming the legs will make it more aerodynamic. We also discussed the use of lures that specifically don’t “match the hatch” along our coastline and have pretty much concluded that the reds are hungry for almost anything that swims near them, even if it doesn’t exactly resemble a natural target. Another lure we’re planning to try is the Culprit 4-inch Incredi-Frog, rigged with 4/0 Daiichi wide-gap hook and no weight. It should attract some attention as well! My advice for anyone pestered by floating grass is to look beyond the saltwater tackle rack at your local tackle shop. Head over to the freshwater department, and give some of those tried and tested lake and river baits a try!